Mandom recently sent me a clutch of the new Dolly Wink nail polishes. The collection comprises 10 Nail Colors, 4 Lamé Nail Colors, a Smooth Cover Base Coat and a Gloss Stay Top Coat. You can see pics of the store display in this earlier post. Dolly Wink is the beauty brand designed by 25-year old Japanese "charisma model" Tsubasa Masuwaka. Thanks to her hugely influential gyaru style, she has the "Tsubasa effect" of increasing the sales of products that she uses. 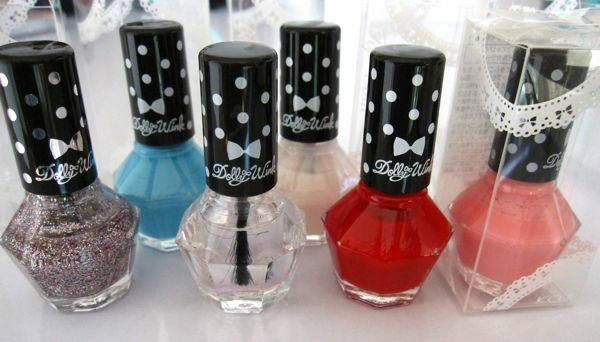 The nail polishes, which are made in Japan, are retailing at Watsons stores in Singapore for S$12.90. In Japan, these are 546yen each. The volume is not stated but given how tiny the bottles are, my guess is that it is less than 10ml. The short handle makes the brush a bit tricky to wield. The brush can cover my nail in two smooth strokes. 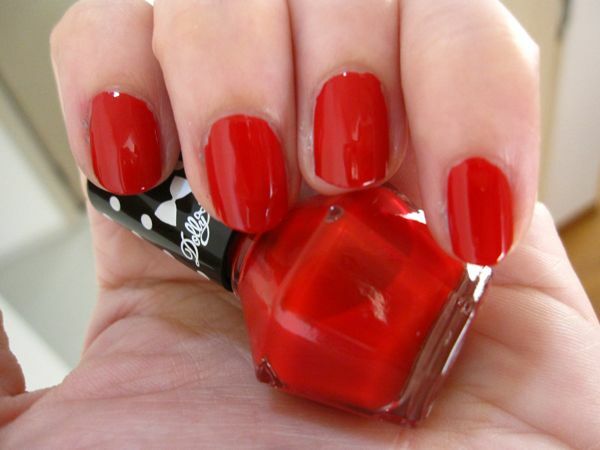 After applying the base coat, I applied 2 coats of Nail Color #1 Red and finished with the top coat. The shades are truly vivid and bright, from the very first coat. Two coats give a nice opacity with no visible nail line. The drying speed was also impressive. After just ten minutes, they were budgeproof and did not smudge or lose their reflective finish when pressed. The official Dolly Wink website can be viewed here. Hi, I saw this collection in Taka Watsons. It is so overpriced at S$12.90 for that tiny bottle abt 5ml. 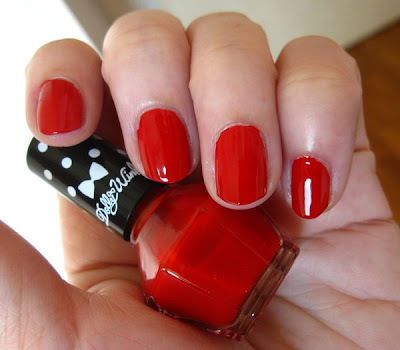 Have you tried Canmake Crackle Lac Nail? There are 3 colours as compared to OPI black shatter. Wow, you're so lucky! We don't have dolly wink in the U.S. and shipping prices are too expensive. :( I like the glitters, the green, and the cand pink one! I haven't tried the Canmake Crackle Lacs although I have seen them in Watsons. I didn't know that they existed until recently. The Makeup Blogette (retailtherapy.onsugar.com) has just posted pics of these, I think. Why don't you try asking Fumiko at http://fumikitagawa.wordpress.com if she can help purchase them for you? I understand that her prices are quite reasonable. The nail polishes are so small and light, shipping shouldn't be that expensive. @Bakupaku i've personally tried the yellow and pink Canmake Crackle Lac Nail and didn;t like both as the formula is somewhat thinner than OPI black shatter. when dried, it looks kinda chalky and thin. the red looks lovely on you! i wanna get some lol thanks for sharing! I think they are now at $10.30 until Feb 2!